Home / The Buzz / Guru to the Rescue! As you all know, we at Guru love our dogs to pieces and the more emails, photos and videos we receive from our Guru fans, the better! Now, I’d like to tell you about one little fella called Rossi. Around 5pm one evening in October, I received a call from a pet parent who said her name was Gill. She was concerned that her 7 week old cocker pup, Rossi wasn’t eating. She’d picked him up from the breeder 3 days before full of excitement; however she was becoming extremely concerned that Rossi wasn’t eating full meals and was only picking at his food. After speaking with Gill it became apparent that Rossi needed some nourishment quickly. We know that dogs are social animals and although many puppies accept their new environment quickly and with little fuss, some take longer than others. Was it a case that he was missing his mother and littermates or did he just not like the food he was being offered? The same evening, I drove to Gill’s house with half a bag of Guru Surf & Turf. When I first set eyes on the little fella he was a tiny ball of black fur. I offered him a small bite of Guru and his nose literally began to twitch. I took the bag of food into the kitchen and was followed by Rossi eagerly wagging his tail. After weighing him and measuring out the correct amount of food, we placed his bowl on the floor. Within no time, Rossi was tucking into his Guru and it was obvious that he was just very hungry. He ate every last bite, licked his bowl then took himself off to his crate for a sleep. My job was done. I stayed a while to chat with Gill to explain all about cold pressed food, including how it’s made, the ingredients and benefits. I’ve stayed in touch with Gill ever since and I personally deliver Rossi’s food order, just so that I can see him! 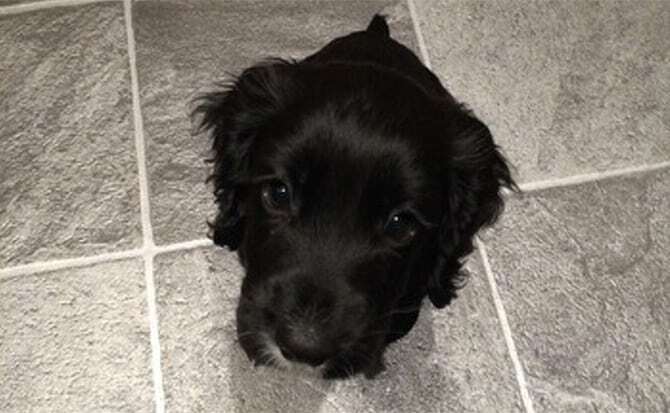 He’s growing fast, he has a beautiful shiny coat, his breath doesn’t smell and I’m told his poos are solid every time – way to go Rossi! If you would like to receive a sample of our food, get in touch and we’ll be more than happy to send you some.